Brand New Sealed (6 Pack Set) Motorola Talkabout MR350TPR. The MR350TPR Talkabout from Motorola is a six pack of weatherproof 2-way radios that are designed for use up to a 35 mile range. Made to be a communication tool for outdoor enthusiasts, the Talkabout radios have been designed to withstand dust and wet weather conditions. They also can operate in a hands-free mode which can be useful to hikers and hunters that need to navigate rough terrains or carry gear. Push-To-Talk Power Boost feature, when activated, allows you to extend the transmission range by increasing the transmitter power output, saving battery life when no power boost is necessary. Three colored faceplates included: blaze orange, yellow and lime green. Weatherproof protection from dust, wet weather conditions such as snow or rain splashes. Hands-free communication for a speakerphone like operation. Built-in LED light offers emergency lighting when needed. Scanning feature to see which channels are currently in use. Low battery alert reminds you when batteries are running low. Runs off of rechargeable battery or 3 AA batteries. Keypad lock prevents your personalized settings from being inadvertently changed. 20 selectable call tones to choose from to grab the attention of your family and friends before you start speaking. MR350TPR includes: 6 radios 6 rechargeable battery packs 2 triple desktop charging base (charges 3 radios at a time) 2 AC adaptor 6 belt clips 6 PTT earbuds 6 BONUS faceplates (blaze orange, yellow, lime green). 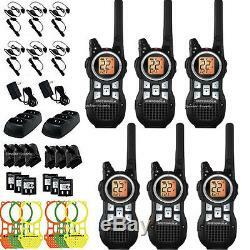 The item "Motorola Talkabout MR350TPR Walkie Talkie 6 Pack Set 35 Mile Range Two Way Radio" is in sale since Tuesday, September 09, 2014. This item is in the category "Consumer Electronics\Radio Communication\Walkie Talkies, Two-Way Radios".